Tyrone got the defence of the McKenna Cup off to a winning start with a routine win over the students of Queens University at Healy Park. Things, however, didn’t look that good after a quarter of an hour as the visitors established a 0-5 to 0-1 lead. The home side were struggling at that stage but once they got into their stride there was only going to be one winner. An opportunist goal from man of the match Ronan O’Neill allowed the holders to greet the short whistle 1-10 to 0-6 in front, all but one of their points coming from frees with O’Neill and teenager Lee Brennan their sole marksmen. Any hope that the students had of mounting a second half comeback ended when Johnny Monroe scored a second goal for the hosts. 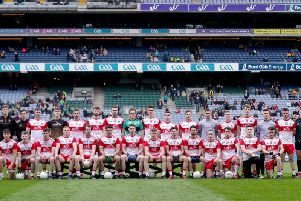 And then fellow substitute Connor McAliskey grabbing another major late on as Tyrone won with plenty to spare - and that despite having defender Kieran McGeary sent off for a second booking in the final quarter. It was Queens who certainly looked the livelier side early on and they could have had a goal after only four minutes but Michael Monan blasted over the bar after going past two defenders. Teenager Lee Brennan, who had a superb game, levelled matters from a well struck forty two metre free off the ground but it was Queens who were the better side. Ryan Murray scored from play as well as from two frees with corner back Greg McCabe also on target as they moved 0-5 to 0-1 in front with fifteen minutes on the clock. Frees from Brennan and O’Neill helped draw the Red Hands level and after the latter had edged them in front he then struck for a well taken 25th minute goal when he chipped the ball over advancing keeper Joe Maguire. Down star Marty Clarke replied from a long range free but O’Neill and Brennan continued to keep the scoreboard ticking over before the Trillick teenager got Tyrone’s only first half point from play in injury time. Tyrone made a couple of changes at the break with Padraig McNulty and Monroe coming on as they picked up where they had left off. Peter Harte palmed the ball over the bar and O’Neill pointed from play from distance before Monroe first-timed the ball to the net in the 48th minute to end the game as a contest. Clarke converted another free with centre half back Brendan Rogers joining the attack to split the posts with a superb effort from play but it was only academic at that stage. McAliskey and Justin McMahon off the bench with the Omagh man and Harte adding to their growing tally. Defender Hugh Pat McGeary then scored his first senior point for Tyrone before McAliskey put the icing on the cake in the last action of the game with a perfect finish to the bottom right hand corner of the net.